Final 12 month checks have been carried out by the Coal Authority on a new pipeline that keeps the River Irwell free from polluted mine water. 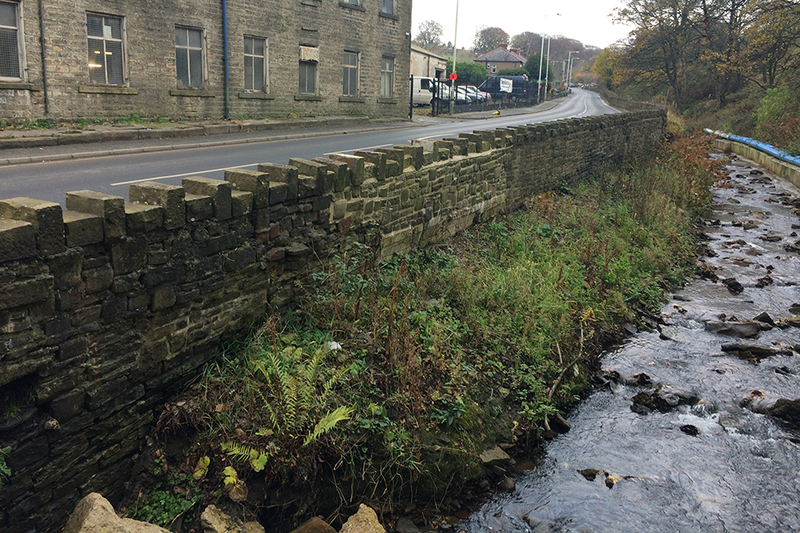 In place for a year, the pipeline is protecting the River Irwell by feeding polluted water flowing from an old adit – or mine entrance – in Bacup, Lancashire, into a treatment scheme further down the valley. The original pipeline was replaced last year in a 3 month operation because its deterioration risked up to 80 litres of untreated mine water spilling into the river every second, damaging its ecosystem. After years of sitting in the river, which flows past Manchester and into the River Mersey, the foundation blocks had moved, bending the pipes and moving them out of alignment. Contractors for the Coal Authority, JN Bentley Ltd, carried out the work with help from business partners Severn Trent Services. We also worked closely with Lancashire County Council, the Environment Agency and other stakeholders to ensure the works proceeded safely, with minimum disruption to the public and watercourse. Ecological surveys were taken to ensure minimal disturbance to the environment. The entire river was dammed and a series of pumps moved the water past the areas of work, allowing excavators and engineers onto the riverbed. Sections were then excavated and large, pre-cast, interlocking concrete blocks were fixed into position to take the weight and firmly anchor the pipe. Chris Crowe, contracts service manager for the Coal Authority, who oversees the operations department, said that the riverbed was also safeguarded against future erosion before it was returned to its original condition: “Careful measurement and surveying works were carried out to ensure that the new works wouldn’t cause a constriction, meaning the river flows as it did previously. “A section of the stone wall had to be removed during the construction, but this was reinstated using the original stones. “With the works occurring so close to a river course, special attention was taken by our contractors to ensure that there were no environmental incidents while they were carried out. Coal mining has taken place around Bacup and in the vicinity of the River Irwell for hundreds of years. Old Meadows, or Scarr End as it was also known, was formally recognised as a coal mining concern in 1854. It operated under different owners, right up to its closure under the National Coal Board in 1969. Its peak output of coal was recorded as 30 tons per day. The adit, on Burnley Road, is one of the most prominent remaining features of the mining activity in the valley. Originally, the mine water went straight into the River Irwell, but is now treated in settlement lagoons and a reed bed before being returned to the river.